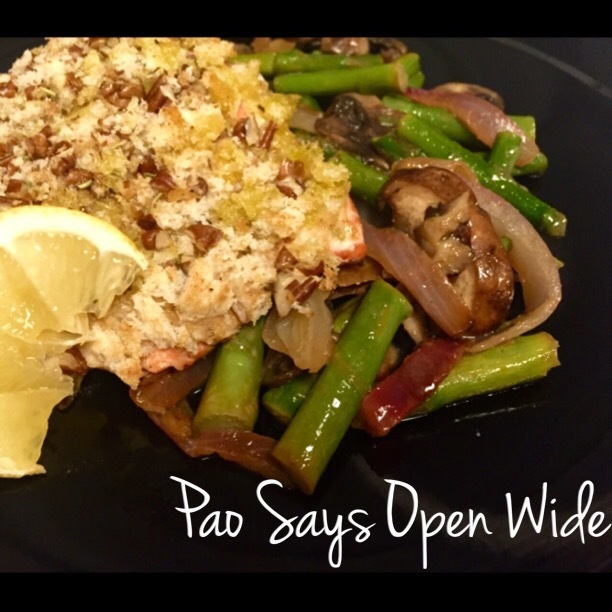 Sister-Sister: Pecan-Crusted Honey-Dijon Salmon – Pao Says, "Open Wide!" My sister, Vanessa, and I have been apart for far too long. A few days ago, she made a bomb salmon recipe that she found online. Lucky for me (and for Ryan), she sent me the recipe so I could try it out too! I have to say, Vanessa definitely picked a winner, and I’m happy to share it with you! She made mashed potatoes and broccoli as her sides, which I think would go famously with this sweet and tangy salmon dish. After eating a huge helping of extra rich and cheesy mac and cheese last night, I decided to drop the potatoes and just go with some veggies. I paired the salmon with a mix of asparagus, mushrooms, and red onions with some butter, a splash of chicken stock, and a squeeze of lemon. The lemon brought out the brightness in the asparagus and added a tang to the veggies that really complemented the salmon. Definitely give this quick, easy, delicious recipe from allrecipes.com a try soon! In another bowl, mix together the bread crumbs, pecans, and parsley. Season each salmon fillet with salt and pepper on both sides. 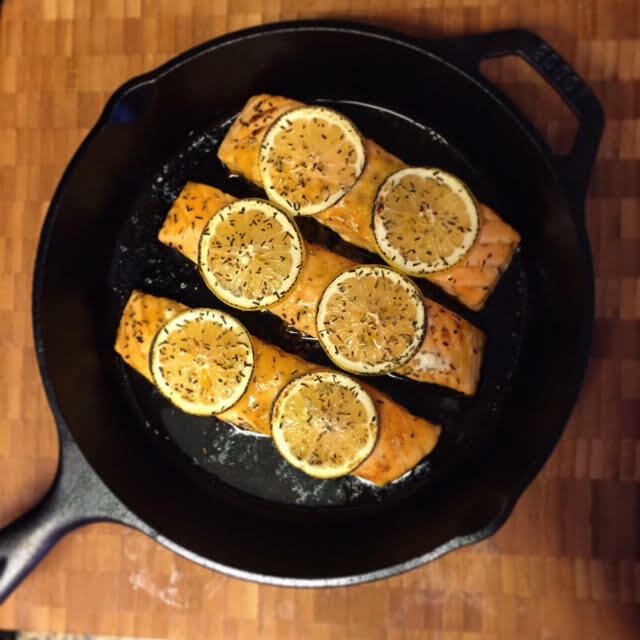 Brush both sides of the salmon filets with the mustard-honey mixture and then place on a lightly greased baking sheet. Cover the top of each fillet with bread crumb mixture and lightly press it into the fish. Bake for 10 minutes per inch of thickness, measured at thickest part, or until salmon just flakes when tested with a fork. Serve garnished with lemon wedges. The main picture on the first page is of a variation I made of this recipe. I didn’t use the breading, and I added soy sauce to the marinade. I put the honey-mustard-butter-soy marinade on the salmon, and then placed 2 thin lemon rounds on each filet. I cooked them in my Lodge cast iron skillet in the same method described above. Check it out!